Ever wondered what happens when you throw something away? In this post we’ll dive deep to learn more about how our trash affects the whole planet, to help understand what we do here, affects people, animals and the environment everywhere. When we trash food, plastic, paper and everything else, it must go somewhere, right? But often that somewhere is a place we we choose not to think about. The true story is that somewhere is actually everywhere: this is the story of how our our trash affects the whole planet. Maybe you think your waste is going into a landfill, or to a recycling facility (most likely it’s not actually being recycled), and hopefully you compost your food waste to turn it into soil. 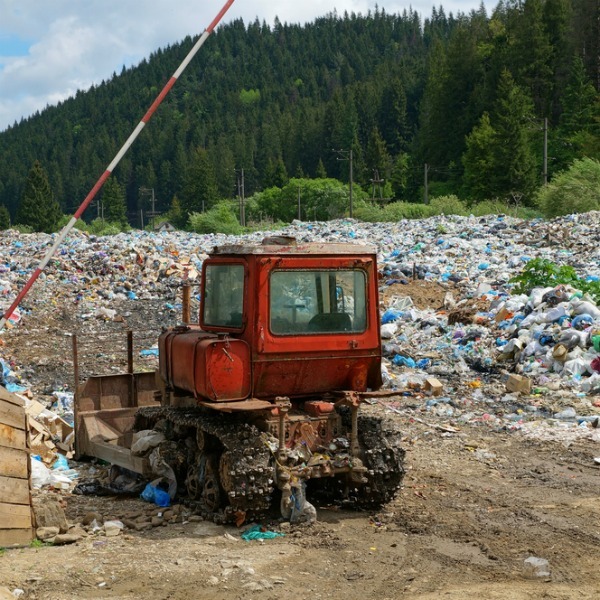 But unfortunately, even though some stuff is going to landfills or recycling, a majority of our waste ends up spreading itself around the globe, either by being transported by wind, water or human; by breaking down into smaller (even microscopic) parts, or by degrading into its chemical components. And these dispersal methods are damaging the health of the animals, people and ecosystems on this planet. Some of the waste is accidental, no doubt. Whether it’s a hurricane that damages a city and sends debris across the ocean, which is what happened with the 2011 Japanese earthquake and tsunami disaster, or products falling off a shipping container in the middle of the ocean. But much of the problem lies in a corporate culture that is not responsible for waste or end-of-life concerns for products, and our need for continuously cheaper goods made from unsustainable, short-life expectancy products. How does our single-use lifestyle affect the ecosystems of the planet? When companies make products, they are not required to think about how it will end its life. For example, there are hundreds of chemicals used in the production of computers, mattresses, shoes, fishing nets and plastic water bottles, but once the company produces the product and sends it off for sale, they are not responsible for the end of that products life. This has led companies to create products with untested chemicals with little concern for the outcome of the chemical body burden (the collection of everyday chemicals that our body absorbs over a lifetime). Many of these chemicals are considered endocrine disruptors, which can impair reproduction by mimicking or changing hormonal activity in animals and humans. Additionally, most products, including their chemical components, are made within a framework of planned obsolescence, meaning that it is designed for the dump, with little concern as to how it might affect the environment. So how does this corporate irresponsibility play out? There are dozens of examples of how trash and chemicals make their way into our ecosystems, but here are some of the worst ways our trash affects the whole planet. This is an oceanic mess of an unprecedented degree. 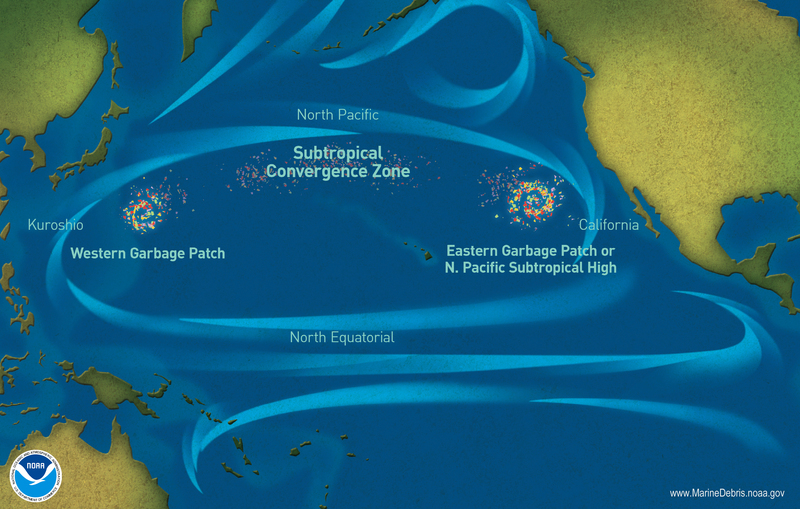 Because the billions of pounds of trash is dispersed over so much of the open ocean, it cannot be dragged in, and because it contains so many type of garbage- including microplastics that have broken down because of saltwater and sun exposure, some of it cannot even be gathered. And plastic never fully degrades, it just breaks down into a smaller and smaller pieces. According to the EPA, every piece of plastic ever made is still in existence. Even though some companies are trying to make use of the plastics from the Garbage Patch, they remain a huge global mess that the mess is not contained to just the patches. The chemicals and broken down plastics that find their way into the ocean and into all of the ocean creatures. This shocking fact is from the Center for Biological Diversity. 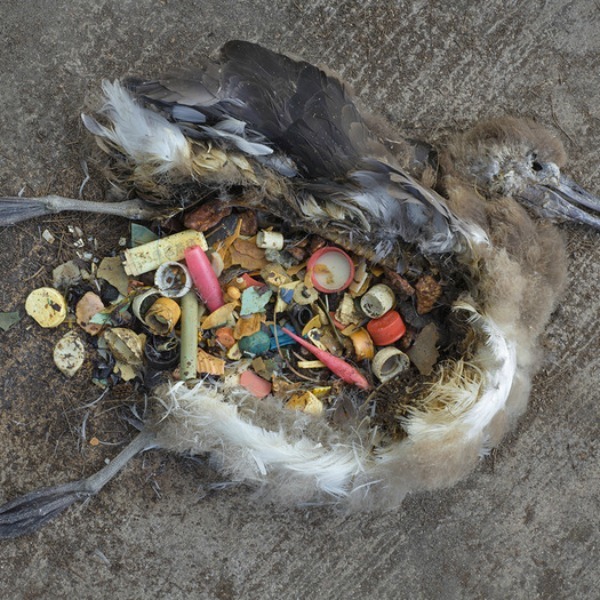 Plastics, whether in the ocean or in other natural environments, are ingested by birds, fish and other animals. The plastics in their bodies causes irreparable harm, but there are also long-term effects to the animals higher on the food chain because of the chemical makeup of the plastics. Most of the products we consume in our daily life are made with petrochemical (fossil fuel-based) plastics, which leech chemicals into the environment though irresponsible disposal or accidental means, like hurricanes. 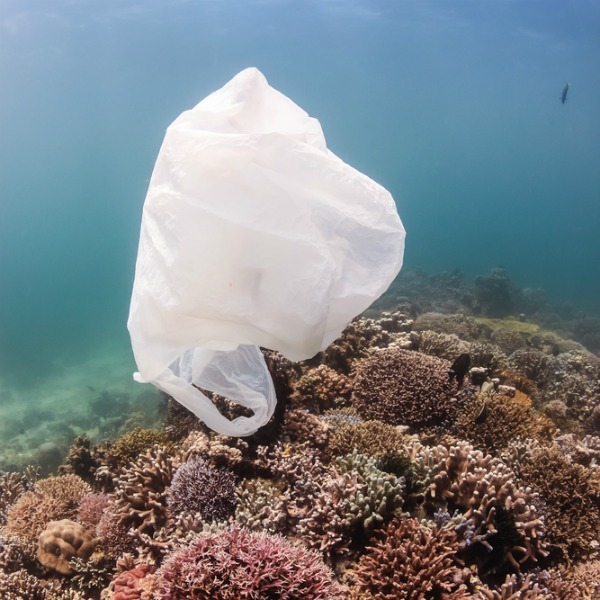 In marine environments, the plastics actually absorb dangerous pollutants like PCBs, DDT and PAH from the surrounding waters, meaning animals that ingest the plastics get a double dose of chemical ingredients. Bisphenol A (BPA) is one of the most pervasive chemicals in modern life. It’s a building block of polycarbonate (#7 is often polycarbonate) plastic and is used in thousands of consumer products, including food packaging. BPA exposure may disrupt normal breast development in ways that predispose women for later life breast cancer. Vinyl chloride is formed in the manufacture of polyvinyl chloride (PVC) or #3 plastic. It was one of the first chemicals designated as a known human carcinogen by the National Toxicology Program (NTP) and the International Agency for Research on Cancer (IARC). It has also been linked to increased mortality from breast cancer among workers involved in its manufacture. Dioxin is formed in the manufacture of polyvinyl chloride (PVC) or #3 plastic. Dioxin has been classified by the International Agency for Research on Cancer (IARC) and the Environmental Protection Agency (EPA) as a known human carcinogen, and is also an endocrine disruptor. Styrene can leach from polystyrene or #6 plastic and is found in Styrofoam food trays, egg cartons, disposable cups and bowls, carryout containers and opaque plastic cutlery. It has been classified by the International Agency for Research on Cancer (IARC) as a possible human carcinogen. These chemicals are absorbed into any animal that ingests the plastic. These animals are then eaten by other, higher food chain animals or by humans. While many of the most dangerous chemicals have been phased out of use or production, they are still present in the marine environments, and thus present in the bodies of animals– including humans. Everyone knows that breast milk is the best food for a newborn, but what if breast milk becomes so hazardous it could be considered a hazardous waste? Seems like science fiction, but it’s true for many of the Inuit people living in what should be a pristine natural environment. The Inuit, the native people of Alaska, Greenland and Canada, live in an Arctic environment that bears few plants and vegetables, so the traditional diet is based on the sea. Sea vegetables, fish, birds and marine mammals make up the bulk of their diets. Because these animals bioaccumulate toxins in their bodies, the toxins then enter the bodies of humans. 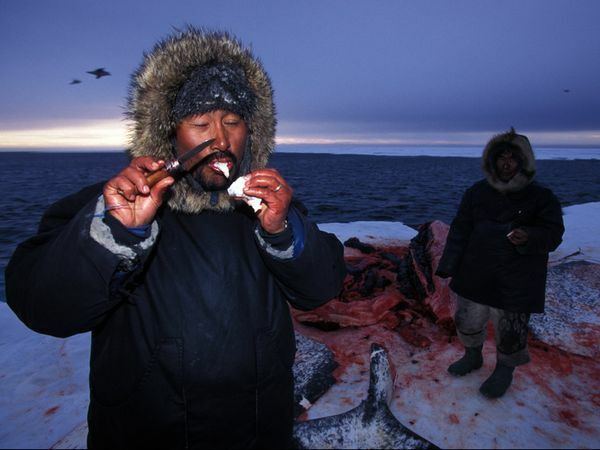 “The Inuit diet of ‘country food’ which includes marine mammals such as beluga whale, narwhal and seal, puts them at the top of a contaminated food chain. The toxins collect in the animals’ fat and are passed on to the Inuit as they eat, or through breast milk. Depending on the amount and type of country food consumed, many Inuit have levels of POPs in their bodies well in excess of the “level of concern” defined by Health Canada. The bodies of Arctic people, particularly Greenland’s Inuit, contain the highest human concentrations of POPs found anywhere on Earth — levels so extreme that the breast milk and tissues of some Greenlanders could be classified as hazardous waste. How do pollutants make their way into the pristine Arctic? In addition to the bioaccumlation in fish and marine animals, and the traditional diet that is based entirely on these foods, toxins arrive by air. As pollutants are created by oil refineries, plastic production and chemical-based agriculture in the south, they evaporate in the relatively warmer air and travel in the wind. When these chemicals reach the cooler weather in the Arctic, they fall to the ground where they are absorbed by the plants, fish and other animals. These are known as persistent organic pollutants, and are considered an issue of global concern. Industry and corporations have created a zillion things to be thankful for: the computer I’m typing upon, the seconhand couch upon which I sit, and the transportation that brings food to my table. But it’s become increasingly clear that the way in which business is being done needs to undergo a dramatic shift. The waste and chemical component of our goods has become too much for our planet to handle, which we can see in the garbage patches, rampant marine devastation, overfull landfills, and in our very own bodies. Want to keep in the loop with green living news and lifestyle? Sign up for our weekly newsletter! Can mealworms help with Plastic Pollution?